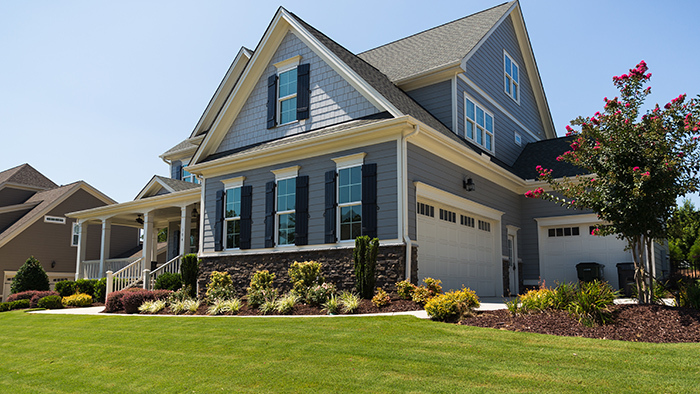 Two new specialty herbicides developed by Dow AgroSciences are expected to hit the lawn care market by fall 2018. Dow AgroSciences has developed two new specialty postemergent herbicides for the turf market. GameOn™ specialty herbicide delivers complete broad-spectrum postemergent control of more than 100 broadleaf weeds including clover, dandelion, ground ivy, henbit, oxalis and plantain. Relzar™ specialty herbicide controls more than 60 broadleaf weeds including chickweed, dollarweed, doveweed, henbit and plantain. Federal registration for both products is pending and approval is anticipated for summer 2018. The products are expected to be available for sale by fall 2018. GameOn and Relzar both contain Arylex® active, a new active ingredient and the first member in a new class of synthetic auxin herbicides developed by Dow AgroSciences. The product was initially developed for the agriculture industry for treating weeds in wheat and other small grain crops. Breuninger says its quick, complete results make it a good fit for the turf market. Arylex active acts as a growth regulator, providing consistent control across a variety of climatic conditions. Arylex active has a unique binding affinity in the plant cell’s nucleus. GameOn is absorbed into a plant’s leaves and begins to move through its vascular system within 30 minutes. In one to four weeks the weed experiences total systemwide death from roots to shoots. Relzar is absorbed by the plant within 60 minutes and produces total death of the plant in two to four weeks. Left, an untreated patch of narrowleaf plantain. 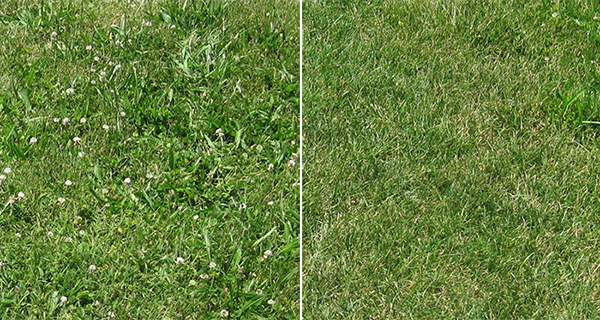 Right: Same patch of narrowleaf plantain after an application of GameOn. According to Dow, GameOn has been thoroughly tested and proven to not harm trees and is safe for use on target cool-season turfgrasses including bentgrass (at mowing heights greater than 0.25 inches), bluegrass, fescue (tall and fine), ryegrass and warm-season Bermudagrass and zoysiagrass. In addition to Arylex active, GameOn also contains fluroxypyr and 2,4-D choline, a unique formulation with reduced volatility that mitigates off-target damage and produces less odor. GameOn is rainfast within two hours and can be used with low-drift nozzles. Relzar contains the active ingredient florasulam plus Arylex active and can be applied to warm- and cool-season grasses with no temperature restrictions. The product is rainfast within one hour and has minimal restrictions when sprayed near water and sensitive plants. Upon federal registration, both products are expected to be labeled to be sprayed in winds up to 15 miles per hour and have less stringent temperature restrictions, which Breuninger says will give LCOs a bigger window of opportunity to use them. Both GameOn and Relzar are most effective when applied to young weeds that are actively growing. While Relzar has been formulated primarily for southern, warm-season grasses and GameOn has been primarily formulated for northern, cool-season grasses, Breuninger says these new products are not limited by geography and can be used in both the north and the south. 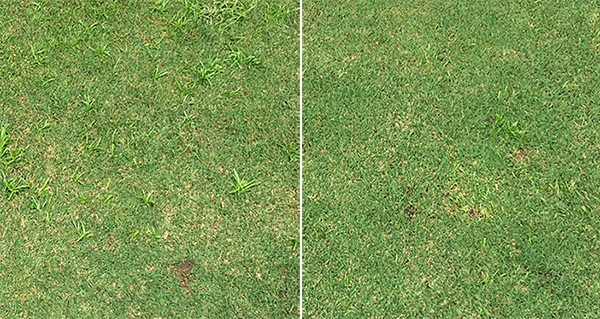 The turf safety of Relzar simplifies things for LCOs—particularly in the Southeast—who often have to work with mixtures of both cool- and warm-season turf, Breuninger says. Arylex is a registered active. GameOn and Relzar have not yet received regulatory approvals; approvals are pending. The information presented here is not an offer for sale. Always read and follow label directions.